This post falls firmly within the ‘Etcetera’ category of ‘Turkey Etcetera’. 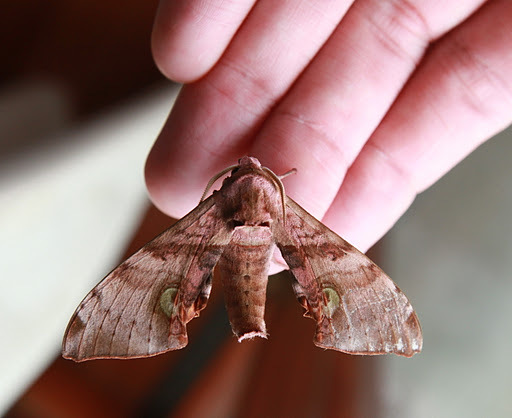 You could say I’m expanding into other areas of interest, which include entomology, and in particular a family of moths, the Sphingidae, or hawk moths, which have fascinated me since I was a child. On a recent holiday to Malaysia I saw several different species, hence this post. On the occasions when butterflies and moths are written about outside of an academic context, it is almost a cliché to mention Vladimir Nabokov. Nabokov was an accomplished lepidopterist. 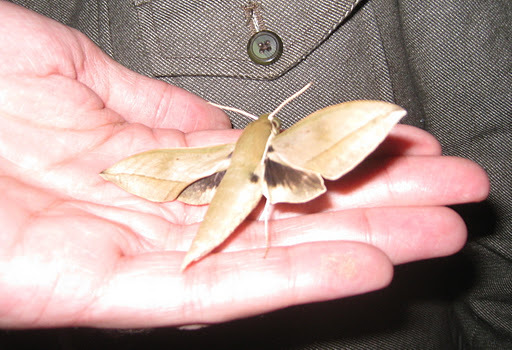 In his memoir, ‘Speak, Memory’, he describes the hawk moths as the ‘jets of my boyhood’. It’s a good metaphor not only for their characteristic swept-back forewings and streamlined bodies, but also for the appeal they hold for children inclined to obsess about and collect insects. 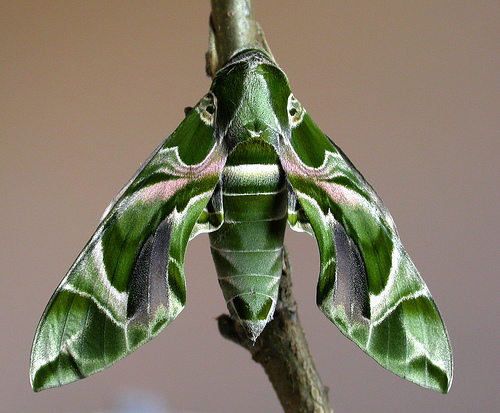 A typical example is the one pictured above, the Oleander Hawk Moth (Daphnis Nerii), a large species occurring through southern Europe, Turkey, the Middle East, Africa, India, and Southeast Asia. 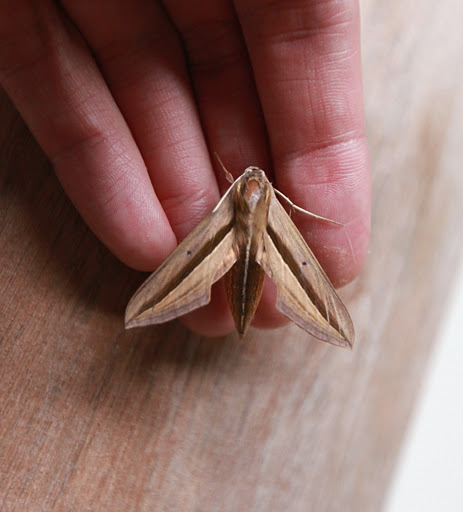 Many of the hawk moth species are varying shades of grey or brown, but Daphnis Nerii, with its green marbled wings and unlikely streaks of pink, is often considered one of the most beautiful of all moths. The Sphingidae are the fastest-flying insects after dragonflies, and can travel at over 33 miles per hour. In contrast to the meandering flight of most Lepidoptera, they are almost bat-like in the air. 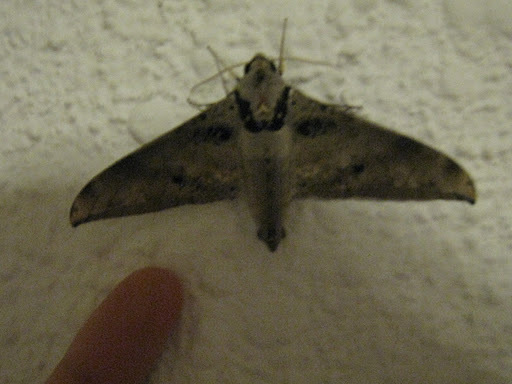 But the moth that sparked my own interest could not have looked less like a fighter jet. It was the Poplar Hawk Moth (Laothoe Populi), one of the most common species found in the UK, but which has a very unusual appearance, holding its underwings ahead of its forewings when at rest, with its abdomen curved sharply upwards. When I found one sitting in an empty bathtub at my home when I was nine or ten, it looked as improbable as an old biplane. 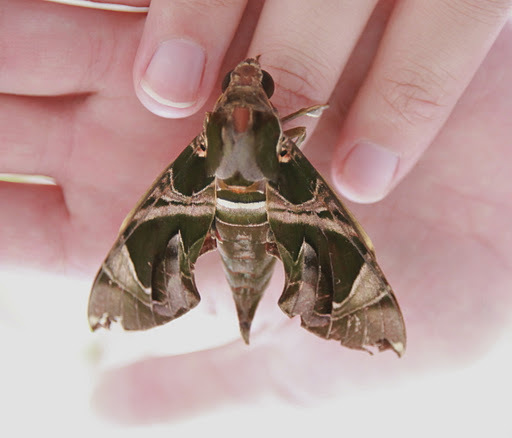 The only hawk moth to have forced its way into the popular consciousness is the Death’s Head Hawk Moth (Acherontia Atropos): large, mainly dark brown, with a yellow and blue streaked abdomen, and a pattern resembling a skull on its thorax. Long considered an ill omen in European countries (for obvious reasons), the moth has some odd characteristics. It emits a high-pitched squeak when alarmed, and often raids bees’ nests to steal honey. This was the moth bred by Buffalo Bill, the serial killer in Silence of the Lambs, and shown (with some minor photoshopping) on the posters for the movie. Despite its distinctive green eyespots on the forewings, it took me a lot of trawling online to identify this one as Daphnusa Ocellaris, quite common and apparently something of a pest in Southeast Asia, where the larvae feed on durians, a type of fruit plant. When I saw this moth, I thought it might be a melanistic form of the Oleander Hawk Moth, pictured at the top of the post. But after doing some research, I discovered it was a similar though less spectacular species, the Jade Hawk Moth, Daphnis Hypothous, which is more typical to Southeast Asia. It is surprising how often there is some subtle but unambiguous mark that distinguishes similar-looking species from one another. Here, it is the white spot at the tip of each forewing on D. Hypothous, which D. Nerii lacks. This ordinary-looking moth is Theretra Silhetensis. The scuff marks that you see on the heads of some of the moths suggest how long it has been since they emerged. Unlike some species of lepidoptera, which only live for a few days, are unable to feed, and whose only purpose is to breed and then die, hawk moths live for up to a month. At first I doubted this was a hawk moth because of the way it held its forewings almost perpendicular to the body – unusual among the Sphingidae. But after a little research I discovered it was Ambulyx Canascens, also apparently considered a pest species in Southeast Asia. This one, photographed mid-wingbeat, is Theretra Clotho. Its abdomen, thorax and forewings are a pretty uniform olive brown colour, which makes it fortunate that I got this picture, revealing its distinctive dark underwings and black spot at the base of the abdomen. And how did I find these moths? By intrepidly hunting the corridors of my hotel, which were open-air and lit during nighttime. It was, as you can imagine, a thrilling holiday, especially for my girlfriend. A TOKI development near Van. 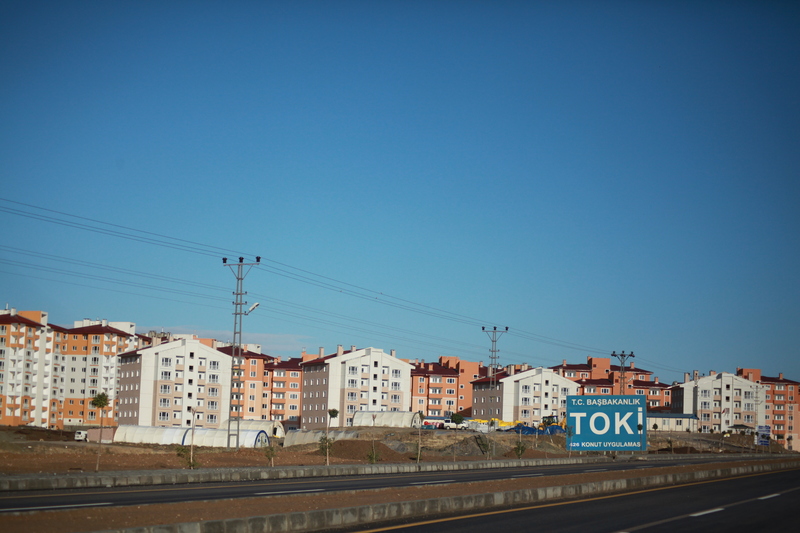 TOKI, Turkey’s mass housing administration, looms large as the villain of Ekümenopolis, a documentary about urban development in Istanbul. It focuses on the greed and shortsightedness of those planning – or failing to plan – for the city’s future, and the devastating toll of urban ‘regeneration’ schemes on poorer communities. Slickly paced with stunning photography, music and animations, it manages a complex exploration of these issues while at the same time being deeply engaging. The film’s name is drawn from the concept of the Ecumenopolis, coined in the 1960s by Greek city planner Constantinos Doxiadis, who envisioned a future in which, if urbanization and population trends continued, the world’s megalopolises would eventually fuse into one global city. Sitting in the centre of Istanbul, it’s easy to forget about the forests of identical skyscrapers proliferating in all directions, but in breathtaking helicopter shots (particularly in the final sequence), Ekümenopolis makes this dystopian future seem frighteningly close. The current planning regime, the film suggests, will result in atomized communities driven into poverty, a glut of unliveable housing that serves only to line the pockets of the construction industry, and environmental devastation. Quite similar to the present, actually. The film effectively juxtaposes the grim reality in neighbourhoods like Ayazma and Sulukule, where residents have been forced from their homes, with oddly creepy TV adverts for new housing projects that will replace them. A particularly memorable moment comes during an interview with development tycoon Ali Agaoglu. He claims that only 15 of the 1,000 families evicted from Ayazma are unsatisfied with the deal they got, in which they were paid around 24,000TL for their homes and were then moved to a new neighbourhood miles from the centre of the city where they were given apartments in exchange for a 15,000TL down payment and then 400TL monthly mortgage payments. Asked about the situation in the new neighbourhood, Bezirganbahce, Agaoglu didn’t even know where the interviewer was talking about. Meanwhile in Bezirganbahce the evictees, unable to make their payments, were facing homelessness and financial ruin. A couple of searing interviews stand out, such as a tirade by one Sulukule resident, Cafer Gitmez, on the scandalous deal being forced on them: to move to Tasoluk, a purpose-built neighbourhood miles out of town (and now virtually abandoned). I’ve written about Turkey’s urban regeneration schemes before here. For excellent coverage of this issue read the blog Tarlabasi Istanbul, by Jonathan Lewis and Constanze Letsch. This post is particularly good. It’s sad that the earthquake in Van is only likely to embolden TOKI and the government in pursuing housing policies that may have potentially devastating social consequences. I recently read a moving account by Jeff Gibbs in which he describes the recent arrest of his Kurdish father-in-law, Kemal Seven. He was seized in the scope of the ongoing KCK investigation, targeting the civilian wing of the PKK Kurdish separatist rebels. According to rights groups, a staggering 5,000 people have now been arrested as part of the KCK case. I’ve written in detail about the trial before here. It is a sprawling investigation relying heavily on telephone wiretaps. No one doubts that the KCK is real, and I can’t blame the government for pursuing it. But there is often a worrying lack of evidence that people arrested under Turkey’s anti-terrorism laws have committed any crime at all. The connections to alleged conspiracies are frequently tenuous or opaque. Other times, the terrorism laws themselves, broad and vaguely worded, are to blame for criminalizing comments, speeches or articles that would be considered, in most democratic countries, to fall within the bounds of free speech. When the prosecutor decided to accuse the BDP academy of terrorism, they had the police sweep the entire school for fingerprints. Anyone who had been there within the past few days was taken—students, visitors, teachers, and even a man from a shop on the first floor who’d gone up one afternoon for tea. This stuff has more or less become the mood music of Turkish politics, so familiar that it barely warrants a mention in the press. Every month, more people are arrested – academics, politicians, journalists, political activists, students – all on terrorism charges relating to one or other of the mass trials currently taking place. What’s really depressing is the standard of the debate surrounding these arrests. There is powerful pressure not to make a fuss about them, coming both from the government, the pro-government media, and some who style themselves as liberals.I’ll run you through some of the arguments commonly employed – all, in my opinion, execrable.1) The arrests are not political, they are about terrorism. We are constantly reminded of this by the government and its supportive media. The term ‘terrorism’ is a pretty useful weapon in the lexicon of the powerful: a scary and serious word the mere utterance of which should immediately silence any kind of critical debate on whatever topic it happens to have cropped up in. This is particularly the case in Turkey. 2) There must be strong evidence that they’ve done something wrong, or why would they have been arrested? This is the most hilariously naive argument of the lot, and all the more so because Turkey is a country in which mistrust of state institutions is generally so deeply ingrained. Occasionally, the police seize someone who is both well known, and obviously not a terrorist: the investigative journalists Ahmet Sik and Nedim Sener, for example, or in the case of these latest arrests, Professor Busra Ersanli and the publisher Ragip Zarakolu. Then, just about, people sit up and start to take notice, but for this to happen, the arrests have to reach a truly astronomical level of absurdity. Sik and Sener- detained on terrorism charges related to the Ergenekon network- had spent their careers fighting and exposing the kind of ultranationalist conspiracies in which they are now accused of complicity. Busra Ersanli, a 61-year-old academic, accused of conspiring with the Kurdish separatist PKK, is not even Kurdish. In both these example, journalists often knew these people and so were personally shocked by the arrests. 3) Let’s just sit back and trust our phenomenal judiciary to puzzle it all out. No matter how absurd the case appears, we are supposed to reserve judgement, and ideally not even discuss it while the infallible judicial process takes its course. The government particularly likes doing this, harping on about the separation of powers and rule of law whenever it’s getting heat for some dodgy arrest or other. When it suits them, Turkey’s leaders can be heroic in their refusal to cross the sacred line between government and courts. Of course, it’s boring to wait several years for defendants to be convicted or acquitted. Concerned citizens may, if they so wish, fill the time with other milder forms of criticism that are more or less OK. 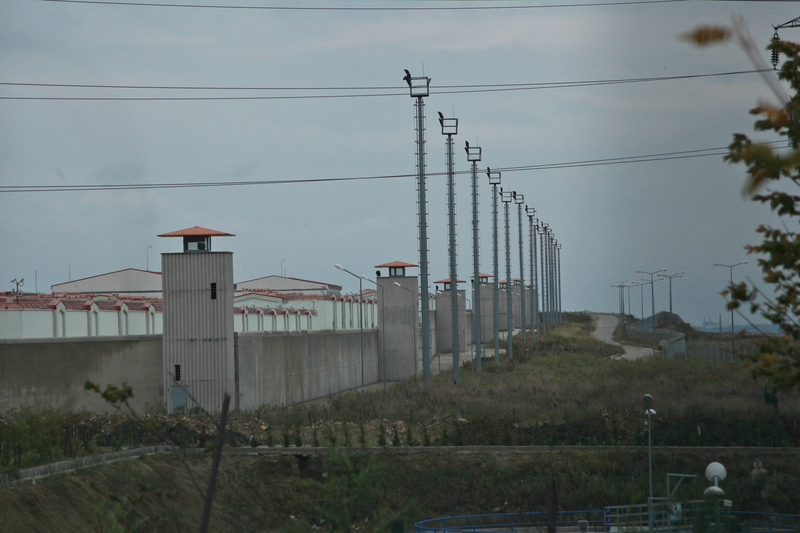 These include complaining about the length of the judicial process, or of pre-trial detention. Work away, by all means – just don’t call the arrests themselves into question. 4) OK, there may be problems, but look how much better things are than in the past.This is the most subtle, and the most often encountered of the arguments put forward by those exhorting us to silence. I’m sure we can all agree it’s a good thing that prisoners are no longer routinely tortured in custody, as in the 1990s – but is it really enough? In some ways I can understand where they are coming from. Many of the AKP’s opponents seek to make these cases part of a disastrous, green-tinted slide into autocracy from the sunny uplands of the secular past. Obviously this is wrong, but you can only give the AKP credit for the progress they’ve made for so long, and for me at least, this point is wearing very, very thin.What’s interesting about all these arguments (which are frequently put out for foreign consumption), is that few of them attempt to justify the arrests themselves. The lack of evidence in many of the more flagrant these cases makes it hard to do. These are primarily arguments against discussing the cases. And when people start routinely saying ‘let’s just not talk about this please’, it’s when you know something’s up. I feel very sorry for the some of these people who have been arrested, as well as their families, who must feel like they’re staring (either literally or metaphorically) at a brick wall.